Hang a monitor on a circular track, the monitor will transmit feed of an arc of light. 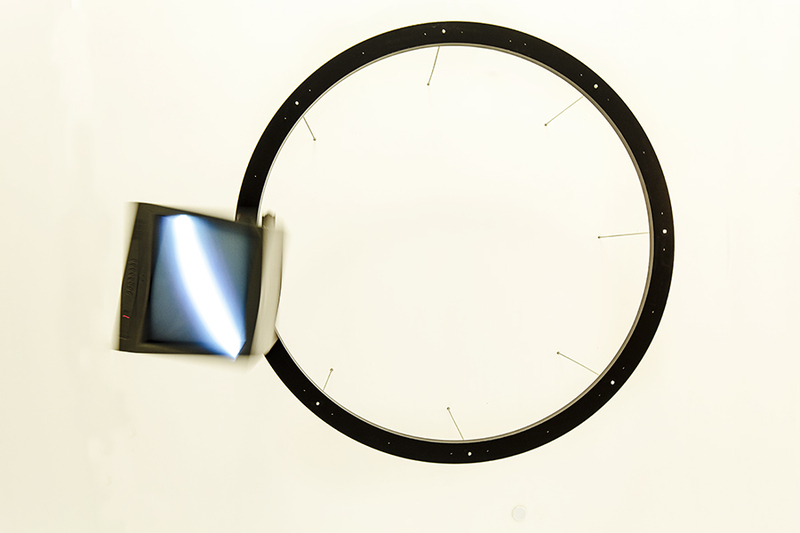 The arc of light on the screen and that of the circular track are from beginning to end identical, no matter how quickly the camera is moving, the screen will spin and adapt to it. In the end, the monitor will complete a completely circular movement under the control of the computer and although everything depends on chance and probability, there will ultimaltely appear a perfectly shaped circle of light on the screen. (It remains to be decided whether a television, a monitor screen or a LCD screen will be used). ＊The title of the piece is Aura, from Walter Benjamin's ideas on the concept of aura in art as discussed in The Work of Art in the Age of Mechanical Reproduction.